Every year the Christmas season seems to come earlier and earlier. I believe it's still on the 25th of December, right? Then why did I get a Christmas catalog in the middle of September?! 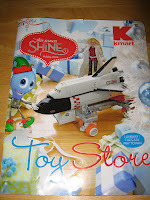 Last week we received in the mail a toy catalog from Kmart. My kids have been studying it like it was the bible and they knew the date of Jesus return! 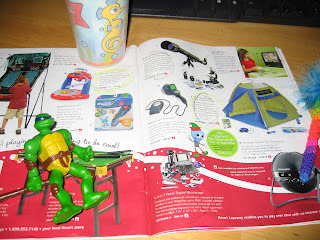 They've circled things, categorized things and told me again and again how much they need these things. Elijah keeps saying, "let's go buy it!" It's time I stood on my soapbox and screamed ENOUGH! I'll admit it - each year, on some level, I do get sucked into the marketing of Christmas. I love the lights, the tree and how people seem to turn around and have a heart to give. How can I make this year different and still special? It's time to start thinking about Christmas - how do I want to celebrate? Sure, we will still celebrate at church and participate in the church Christmas play. I mean beyond that. How will I celebrate? How will I weave in my new frugal lifestyle? One thing I know for sure - this toy catalog is going in the recycling today... and every other one that comes in my mailbox this year! Do you plan to celebrate differently this year? Here's something we do to keep the commercialism out of Christmas--Our kids only get three gifts under the tree from mom and dad, just like Baby Jesus got three gifts from the Wise Men. It's a small thing, but it helps!